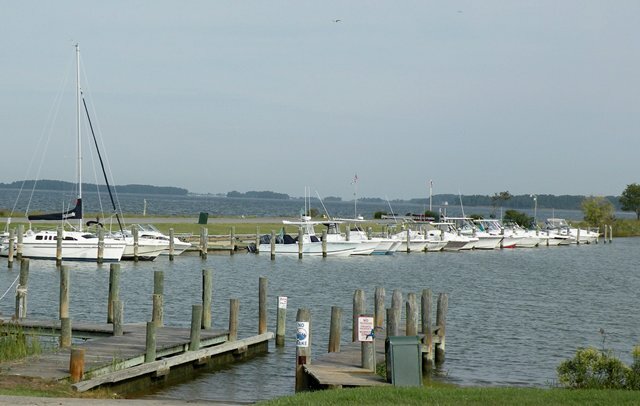 Use of the Boat Basin facility is limited to the hours between 6 a.m. and 10 p.m. Slips are available to lot owners in good standing actively residing in Prospect Bay West and can accommodate boats up to 28 feet yearly fee is $800.. Current ownership of a registered boat is required for slip rental. Slips may not be transferred to new owners or tenants in the event that a lot is sold or leased. Available slips are assigned from a waiting list. A $100 deposit is required to be added to the waiting list. This deposit will be deducted from the boat slip rental fee when a slip becomes available. The deposit will be refunded if the member does not take a slip when one becomes available and the member's name will be removed from the waiting list. Use of the launching ramp is restricted to members and their guests. Vechicles parked at the launching area must display a current sticker. Stickers are available at the Clubhouse administrative office during business hours. All vechicles/trailers should be parked away from ramp to allow proper access by other vechicles using the ramp. Vechicles parked at boat slips should use the paved surface for parking to avoid weakening the bulkhead. Boat Basin speed is 6 mph- no wakes. Fires, flames, or barbeques of any kind. Dumping of waste, garbage, trash, etc. Crab pots of any kind, placed in the basin entrance including inside the rock jetties. Parking vechicle or trailers overnight. Any trailers parked for more than 24 hours will be towed and stored at owners expense. Painting of pilings, changing decor or displaying flags, etc. Hanging wash or drying towels. Berthing of boats other than the slip holder's boat.